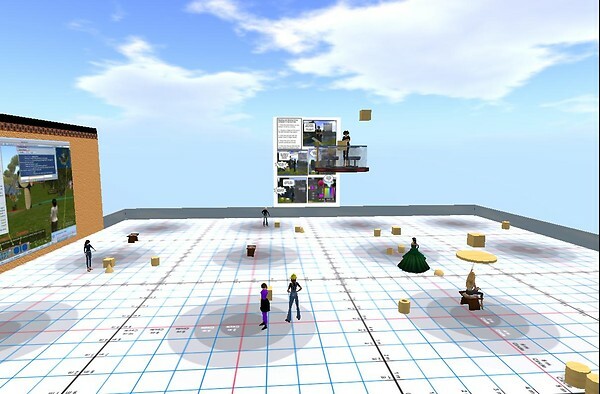 Then we teleported up to our skybox classroom and had fun rezzing items from the standard-issue Library folder. I was surrprised at what all was in there – a go-kart, a rocket launcher, a beach ball, chairs, plants….all sorts of goodies. And, as is always the case when you teach, you learn things yourself. Did you know that when you rez something from the Library folder, then take it back, it goes into your regular inventory? News to me…. We had a little trouble getting everyone up there to the skybox – some late-comers, and some people having lag problems. But Chimera played “sweeper” while I lead them through the rezzing exercise. Once everyone was warmed up, we went out onto the skybox “deck” (large, roofless, open space with a grid pattern on the floor which we are using for building projects) for their first building lesson. Chimera led the way, from her platform perch above the deck and it all worked out very well. She walked them through rezzing a sphere, moving it, resizing it, naming it, and then coloring it. Of course, each participant is at a different level – some are experienced SLers, some are brand new. But we tag team – while Chimera is teaching, I stay close to answer the questions that people might have, trying to work them through their difficulties in private IMs, so as not to choke up the local chat. We’ve set it up so that Chimera and I are the only ones talking (we take turns), and that keeps the possibilities of active mics, the inevitable screeches or interruptions to a minimum. I do notice though that the newer members have trouble simultaneously following the lesson and what’s going on in chat. Tricky for everyone, really. After our building lesson, we moved on to a navigation item (each Thursday session will have the same three components – a fun game to start, a building lesson, and a navigational thing). This time – filling out your profile. 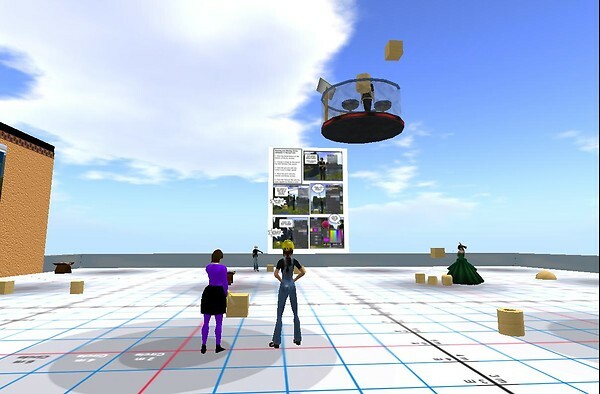 We had just gotten started when Chimera thought it would be fun to experience a tornado in Second Life. She set it off and —whooosh!! Before we knew it, we were all blown in the air and sucked down through a hole in the Skybox, falling and tumbling over 2000 meters through the sky, down to the ground. It was quite an adventure. No one was sure what was going on, but they were good humored about it. And that was our session. I have to say that one thing I find disconcerting about teaching in SL is that, as we’re going, I’m not sure how it’s going over with the “students”. I can’t see their faces to know if they are with me. Are they nodding off? Are they confused? Do they have questions? We ask for feedback from them in the local chat, but that’s sporadic, and not everyone answers everytime (for some of them, it’s hard to find local chat, monitor it, and type while they’re trying to concentrate – so I understand). But that is one drawback of teaching virtually. We tried recording this session using Garageband. It worked great for the parts where I was speaking but it didn’t pick up Chimera’s part, becuase, of course, I needed to change the input from my microphone when it was her turn. Rats. Ah well, it’s all a grand experiment! 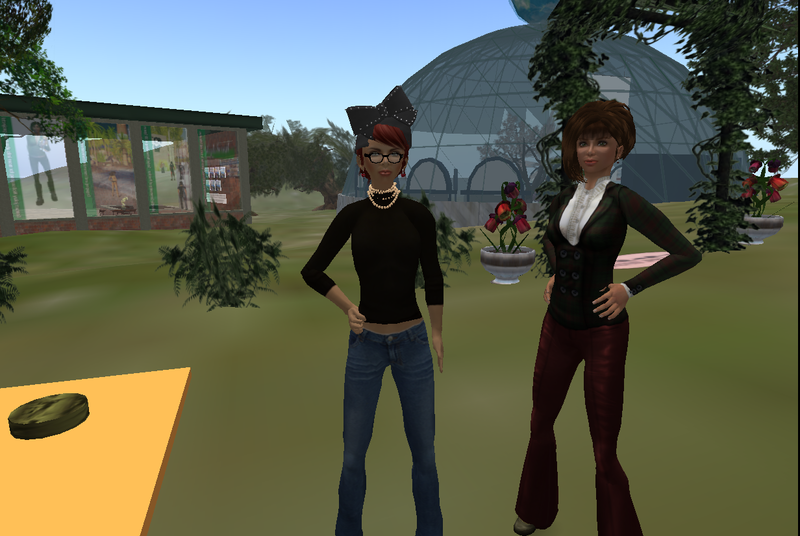 My colleague, Liz Dorland (SL= Chimera Cosmos) and I (Spiral Theas) decided to organize a Second Life Eduator’s group. 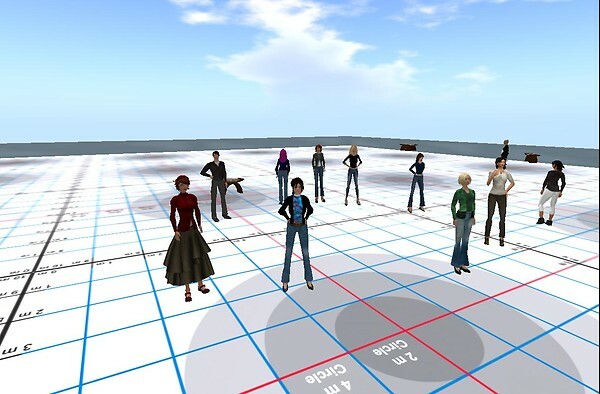 We kept meeting these fabulous teachers who wanted to learn more about the application of the virtual world to education and so, we thought, what the heck – let’s set up a workshop series for these teachers. We’ll meet for just an hour – two times per week (Tuesdays and Thursdays) for four weeks, as an experiment. We can show them beginning navigational stuff, introduce them to basic building skills, and take them to other educational builds, favorites of ours, for inspiration. What sounded like an easy and fun idea has turned out to be quite a bit of work – but it’s also even more fun that I would have imagined. First of all, it gives Liz and I an iron-clad excuse to investigate lots of interesting places and activities we’ve been wanting to learn about any way. 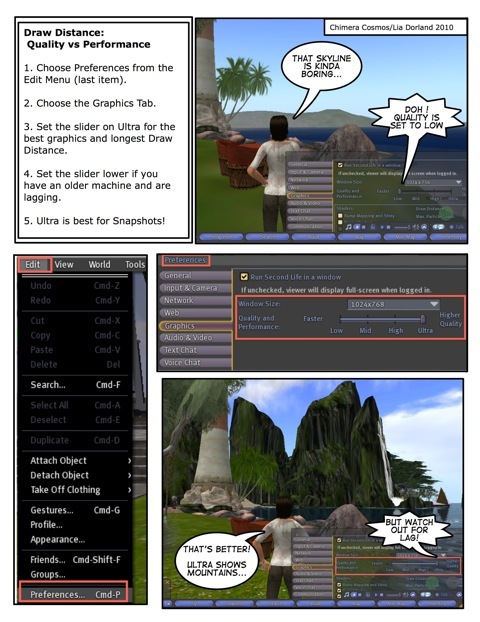 It’s also forced us to be more systematic about understanding the basics of getting around in Second Life (as always, you learn the most when you are going to teach). We’ve created handouts and step-by-step instructions for the participants. Then, of course, we needed an online place to store and display all of those, as well as a place to keep the schedule – so we built a wiki site for the group. And then we wanted to document the sessions – so we started a Koin-Up group where everyone in the class can post photos. Now, I’m experimenting with recording options so that we can archive the sessions. Today was our first meeting. 13 teachers showed up (there will be 17 when everyone attends) and they’re from all over – Great Britain, Colorado, Missouri, Indiana, and Boston. Some teach college students, some are curriculum developers, some teach primary years, and some secondary grades. Men and women – older and younger – some experienced in SL and some brand spankin’ new. I love the diversity. We started with some basic navigational stuff (creating landmarks, map reading, inventory) and then we teleported up to our skybox classroom. Everyone learned how to “buy” a chair, find it in their inventory, and then rez it on their spot on the classroom floor. Then we had a little lesson in camera controls, learning how to zoom in/out and focus. After that. we teleported down to the ground and then bounced over to Chichenitza for a bit of fun. Everyone picked up the free Mayan costume and then climbed the magnificent stairs to take in the view from the top. I was very impressed with how well everyone did. They seemed to follow along beautifully and were patient with the various technical hassles one inevitably has with a platform like this. For Liz and me, it was great fun and a welcome challenge. We work well together – trading off the various responsibilities, and supporting each other (I would never do this by myself!). When one is leading the class, the other is adding helpful explanations to the backchat, taking snapshots, and giving extra support to those who need it. I’ll try to record impressions and lessons learned here, on the blog. That should help me extract my own learning from the experience – and help us remember what we did!